JAC Rein SUV was introduced in the Russian market and to the production TagAZe and well-proven. 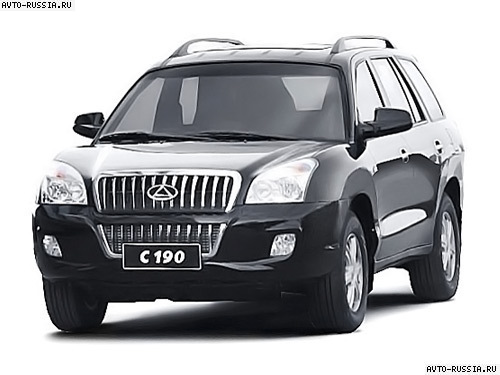 The model is the first car in the line of JAC, who gave the start of a rapid and successful development of the automobile in the direction of the line brand. However, in 2011, with the change of trade name for Russia, and carried out some external restyling. Major improvements to the underbody. Updated front and rear bumpers, enlarged grille, modified front and rear fog lights, removed, 8 parts of the lower body kit: moldings and door flashings. The radiator grille on the front bumper was extended, giving the car a more respectable vid.Novye front fog lights krupnee.Obnovlen steel rear bumper and rear fog lights. Abandoned aprons wheels and lower side moldings, as in the new design concepts they were not relevant. Traditionally, technology has been improved body welding, increased the number of spot welds, providing greater strength sutures. Body passes anti-corrosion treatment on the existing standards TagAz and painted in metallic colors. In May 2011, the model produced under the brand TAGAZ and is called C190. In the dealer network has been vypusheno two small batch of cars, and the end of October new arrivals are expected in showrooms. New SUV in the lineup is all-wheel drive crossover TAGAZ terrain. The control system is an automatic four-wheel drive. In normal driving conditions, the system offers up to 100% of input power to the front axle, instantly reacting to changing road conditions and redistributing torque between the axles. Transfer case is the so-called dual differential — consists of a front axle differential and viscous coupling that transfers torque to the rear axle (and may alter the transmission of torque). All-wheel drive accessories S190 (MT1) is also equipped with a limited slip differential rear axle. While the model is offered in a complete set with all-wheel drive, manual transmission and a 2.4 liter engine with a capacity of 136 hp Equipment set sufficiently rich that meets the highest standards in the class SUV.
? Electric and heated door mirrors, etc. The price of this vehicle equipment is 699 900p. All tests were carried out. "Approval of a vehicle type" has been obtained. The implementation will be done through the existing dealer network TagAz. The novelty is already possible to ask in showrooms. Serve cars planned authorized service company. Model applies to the single factory warranty of 3 years or 100,000 kilometers.